This is another of the many Legend of Zelda fan groups out there. Considering I myself am not exactly a great artist, artists of all skill levels can join under one condition, they are zelda fans. ''Hero, Ya Always Save Us'' - A Zelda-ish ParodyA Zelda Parody, Based on "Jonny I Hardly Knew ya"
The wizard carried off the girl, Hyrule, Hyrule. You’re off to save her and her world. Hero, ya always saved us. With sword and shield and tunic, save Hyrule, Hyrule. The land that hides the Triforce. Oh princess, dear, he’s always here. We counted on the blue-eyed beast, Hyrule, Hyrule. We hadn’t doubted in the least. We mourned when sword and shield had ceased. Epona lay beside the grave, Hyrule, Hyrule. “Where did they go…?” Ghirahim mumbled as he turned in circles, making some of the flames die down as they began to burn his coat. Awesome LoZ artwork. What more can i say? Sure! Sorry it's taken so long to reply! Go ahead and send a request! Don't worry, I'm stupid too XD. 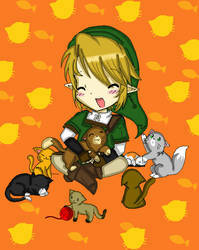 I'm only in the group as what I am because I'm a friend of the leader and a huge fan of Zelda. I'll ask my friend later how to do that XD. What ever became of that Skyward Sword collab? I never heard anything else about it after I entered. Just wondering. I have no idea! I was not a part of it!